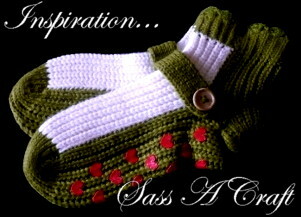 Inspiration | Sass a Craft - Muslim Women are Smart & Crafty Too! I spotted these numbers in a local sooq (marketplace) two months ago. Too cute huh? – wooden buttons and all. The urge to take up knitting and crocheting grew. I won’t delve into this area of craftiness any time soon, but I am most definitely intrigued. I’d love to make some booties for my daughter one day, In Shaa Allaah. Check out these tutorials….